We aim to ensure that each child achieves their full potential, both personally and academically. We know that every child deserves the best possible start to their education. Our excellent teachers inspire children with exciting opportunities for learning. The school is committed to the continuous development of our staff to ensure that the best professional practice underpins our drive for pupil success. Our expectations are high; children are supported and challenged to make rapid and sustained progress, and to achieve high academic standards. 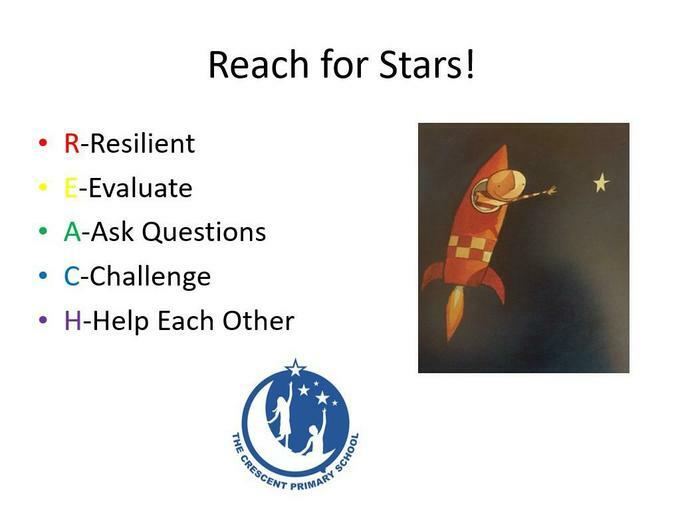 REACH for Success is a phrase which is understood by all staff and pupils. It describes the learners that we want to nurture at The Crescent. The statements are broken down into targets for children in each age phase across the school.